August 23, 2017, 5:00 p.m.
Saturday, August 26th marks Floyd Mayweather’s second return from retirement in response to yet another challenge from a southpaw. This time it’s Conor McGregor, the reigning UFC Lightweight Champion, who will step out of the mixed-martial arts octagon and into the boxing ring to face off against Mayweather. New YouGov data reveals that 28% of Americans are interested in the fight and 10% of Americans plan to watch the fight live. 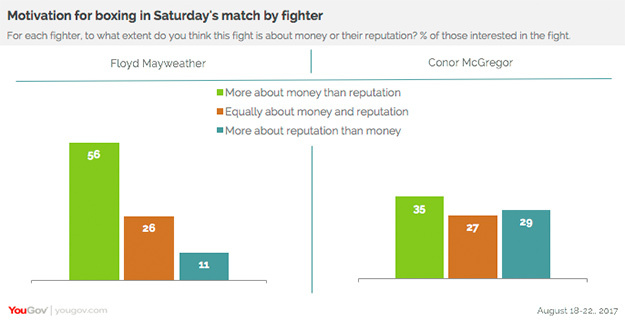 YouGov asked those who plan on watching the fight what they think the outcome will be. 50% of those respondents believe that Mayweather will win while only 27% think McGregor will beat the odds. Of all fans interested in the fight, most think Mayweather will win by decision. Of those that favor Mayweather to win, 59% believe that he will win by decision rather than knockout (41%). 58% of spectators who pick McGregor as the winner believe that a knockout is his best chance rather than letting the match go to the cards (42%). 45% of those interested in the fight say that it will be exciting. Others want to see how McGregor fares against a boxer (39%), their friends and family are watching so they’ll follow suit (32%), and some just want something to do on a Saturday night (25%). Months of prize money negotiations precede Saturday night’s fight in Las Vegas. 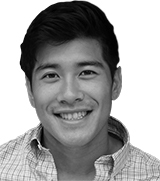 Indeed in both fighters’ cases, fans think that the match is more about money than reputation – more so for Mayweather than McGregor since the former could bring home 70-75% of the purse. Mayweather’s last victory against Manny Pacquiao drew mixed reactions from fans despite a unanimous decision in his favor. 38% of respondents who watched the Mayweather/Pacquiao were satisfied with the performance and 36% were disappointed. Whether this hotly anticipated fight will actually live up to the hype still remains to be seen but as it stands, just 60% of those who watched Mayweather’s last professional fight against Pacquiao say they’ll watch Saturday’s bout against McGregor.